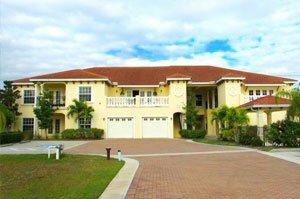 Villa Veneto is an intimate community of just a pair of two-story condominium buildings at the intersection of Fairway Boulevard with Guild and Golf Drives in the island of Venice. Built in 2016‒2017, this development celebrates the Old World in its prime location after having modeled the property’s low-rise builds after the Renaissance country homes in the Veneto region of northern Italy. 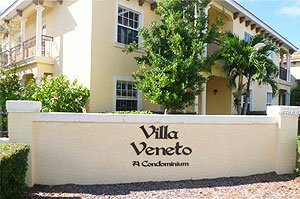 Villa Veneto occupies a 1.13-acre site which served as a canvas for a friendly and close-knit community with just 12 residential units enriching the stock of Venice condos for sale. This condominium’s charming Old World character and artisan craftsmanship are at once evident in the patina and organic texture of its two buildings’ stone and stucco exteriors with accents of wrought iron detailing. Villa Veneto is one of four related local infill projects which essentially builds upon the underlying Renaissance architectural theme of historic Venice Island. These projects also include Che Vista on Esplanade North and the Tra Ponti Villaggio on Tampa Avenue East as well as the San Lino community on East Venice Avenue. The unique quality of life that Venice Island offers is well-pronounced in the amenities bundled with Villa Veneto condos for sale. 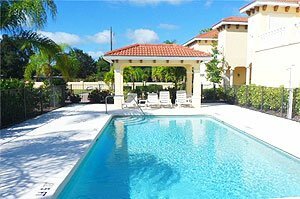 These residences are nestled amidst lush tropical landscaping, and the condominium facilities provided include a heated swimming pool, gazebo, and ample parking for residents and guests. A gated compound, Villa Veneto is enclosed by a stylish stucco and wrought iron landscape wall. Robust in its construction, Villa Veneto was built with reinforced steel-reinforced footings and concrete tile roofs. The construction of the two buildings incorporated hurricane anchors on all trusses embedded in concrete. The high quality paint used in the buildings was specifically formulated for local climate conditions. The charms of Villa Veneto condos for sale are well-presented in the warm and rich detailing of their gracefully articulated interiors. These special features manifest in the residences’ patios with low maintenance columns and segue to the units’ nine-foot-plus ceilings for both the first and second. Each condos’ garage is as impressive in their 9’ × 7’ doors with keyless entry and two-transmitter openers. Built six units each per building, Villa Veneto condos for sale have six floor plans to choose from. Their living areas measure between 1,450 and 1,800 square feet designed with three to two bedrooms and two baths per unit. The residences are priced in the upper $200s up to the $300s. Villa Veneto, besides its architectural charm and reasonably priced units, draws prospective buyers of Venice condos for sale with its convenient location. Its site is walking distance to two of the commercial hubs in Venice. Just north of this community is Venice Shopping Center which is anchored on a Public Super Market. Southwest of the community across South Tamiami Trail are retail alternatives at the Rialto Shopping Center. Restaurants, local schools, the hospital in Venice, and its Chamber of Commerce are likewise just minutes away from Villa Veneto. Additionally, the Venetian Waterway Park and Trail stretches east of this community, enabling its residents easy to easily access the points of interest in downtown Venice and the nearby Gulf beaches. Below are the current real estate listings available at Villa Veneto.